Home > News & Blogs > Brain Injury > Does cooling limit the impact of brain injuries suffered at birth? 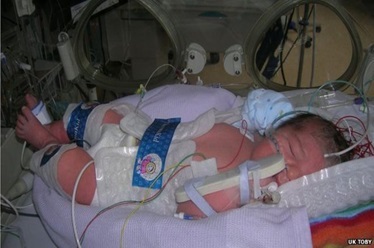 Controlled cooling is used by the NHS to treat newborn babies who have suffered brain injuries following oxygen deprivation during labour and/or birth. Other treatment options include medication, therapy and surgery. Surgery is sometimes used for children who have experienced severe head trauma during the delivery period. For example, if a birth injury caused bleeding in the skull cavity or if there are any broken or bleeding blood vessels and/or skull fractures, surgery can repair the fractures, stop the bleeding and prevent more damage to the vessels. I am a child brain injury solicitor with Bolt Burdon Kemp and I specialise in compensation claims for children who have suffered brain injury. Many of my clients have suffered brain injury at birth, often due to oxygen deprivation. Around one in 500 newborns in the UK suffer from a lack of oxygen around the time of birth. Brain injuries suffered at birth can have a devastating impact on the injured child and their families, which is why this treatment option is so important. The purpose of this blog is to raise awareness of this procedure as a treatment option for babies who suffer brain injuries at birth. When should cooling take place? Doctors need to ensure that the child’s parents or carers understand what is involved when deciding whether or not to go ahead with the treatment. They must also ensure that the results of the procedure are monitored. Cooling should only be carried out in units that are experienced in the care of very ill newborn babies and by healthcare professionals with training in cooling procedures. There is little evidence as to the benefits of cooling for babies with less severe brain injuries. Doctors also face difficulties deciding whether some babies are too ill to benefit from it. If a baby qualified for cooling, but was not offered the treatment, this could be considered negligent. Cooling should be available to every child born in this country. If a baby is not born in a hospital where cooling can take place, then the baby should be transported to another nearby hospital where they can undergo the procedure. The procedure is used to cool the brain in order to reduce damage. Researchers claim the therapy works by slowing the production of harmful substances in the brain and the rate of brain cell death. Cooling is usually carried out on babies delivered at 36 weeks or later. The procedure involves lowering the baby’s temperature from the normal body temperature of 37 degrees, to a temperature between 33 degrees and 35 degrees. The procedure is carried out soon after birth and continues for a few days afterwards (usually for 3 days). The baby’s body is usually cooled by a special mattress filled with cooled fluid. Sometimes just the baby’s head is cooled using a custom-made cap. The baby’s temperature is checked throughout the procedure, usually using a probe placed in the baby’s bottom (measuring rectal temperature). The baby is then gradually warmed up until their temperature has returned to normal. The medico-legal expert and paediatric neurologist I spoke to comments that children who undergo cooling have a completely different developmental profile to those who did not undergo the procedure and interestingly the pattern of injury on the MRI scan is also completely changed. He states that the structure of the brain is preserved much better than it used to be (in cases where cooling did not take place). He notes that children with cerebral palsy experience improved movement and posture if they have been cooled. What are the potential benefits of cooling? The New England Journal of Medicine study showed newborn babies given the treatment were more likely to have higher IQs at school age. If an infant has suffered brain injuries due to oxygen deprivation, cooling provides a non-invasive tried and tested way of improving both their chance of survival and their quality of life. It’s extraordinary that such a simple treatment can make such a dramatic difference to a child – and the lives of their family. What are the potential risks of cooling? Complications of the procedure can include problems with metabolism (the chemical processes in the body affecting energy and growth), infections, problems caused by thickened blood and fits, which can sometimes occur if the baby is heated up too quickly after cooling. In some studies babies have been found to have skin problems and bleeding under the cooling cap. The procedure is safe and regularly used by the NHS for babies who meet the diagnostic criteria. One of our clients suffered cerebral palsy at birth following oxygen deprivation due to umbilical cord prolapse. She was born in poor condition and required resuscitation. She qualified for cooling due to the severity of the oxygen deprivation and was cooled for 3-4 days. Our expert paediatric neurologist advised our client’s father that had she not had cooling, she would have been unresponsive. Although her speech is delayed she is able to say some words and she attends nursery three days a week. Our client’s father said that in terms of agreeing to go ahead with the procedure, it was a “no brainer”. He describes the procedure as “marvellous”. It is not an overstatement to say that cooling has been life changing for both our client and her parents. As with any medical procedure, parents should be advised of the risks and benefits of cooling before they agree to go ahead with it. Why does my baby need cooling? What are the benefits of cooling for my baby? What are the risks and how serious/minor are they? What care will my baby need following the procedure? What could happen if my baby doesn’t have the procedure? At Bolt Burdon Kemp our Child Brain Injury Team only act for children who suffer brain injuries, that’s why we are experts in this field. We are dedicated to investigating claims where substandard medical treatment has caused a baby to suffer a brain injury.